These words are being written in March 2019…more than 1/2 year since Scissor Lift #1 was completed. Scissor Lift #1 is the first in a series of Jim’s Gym automata (kinetic art). The build was between approximately February – July 2018. The top level design concept is to design rolling marble machines in the form of gym equipment, with member of Jim’s Gym operating the exercise machines. Powered only by hand, the Jim’s Gym member pulls up two handles, which in turn raise a marble to the top of the rolling incline. The marble, using gravity, then descends to the regulator where it waits for the next trip to the top. This Scissor Lift #1 is not for sale, rather it is gifted to my wife. It is, however, the prototype for future Scissor Lifts, which will be created and released in a numbered and unlimited fashion. The Scissor Lift has been fully designed my Jim. It took about 5 months to be completed. This Scissor Lift #1 is a pleasure to operate…very smooth. There are about 30 ball bearing assemblies in this build, along with other nylon and brass bushings, stainless steel shafting, lots of baltic birch plywood, leather, and a mechanical counter. If you have an interest in acquiring a Scissor Lift please contact me. While this is a good automata, it has shortcomings. For example, I created this Scissor Lift to utilize 1″ marbles. After the build was well along my wife and I got onto eBay and ordered 1″ marbles that were of a design that we liked. It turns out that all one inch marbles ARE NOT created equal. Some of the marbles failed to operate in this Scissor Lift #1. Subsequent automata will all be created with enough clearance for 1-1/8″ marbles. 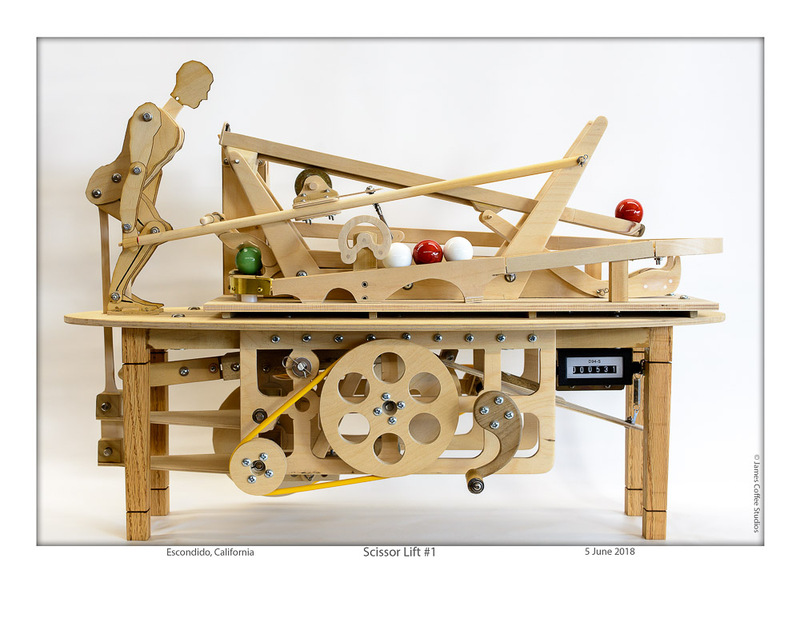 Paint makes a difference in how the automata operates…in particular it makes a difference in the “roll” of the marbles. I learned that I need to allow very sufficient drying times…and then I need to sand the rails at the contact points (where the marbles roll) so that they are rolling on unpainted wood. I am having trouble “getting into the saddle” with the little bipeds. The biped created for this first Scissor Lift is relatively unfinished…and will remain that way. Since creating this first Scissor Lift I have almost finished Scissor Lift #2 and am about half way through Big Wheel Lift #1. I have created two more bipeds. The process is easier but certainly not yet a refined effort. I am hopeful that one of these days I will be able to easily create credible bipeds.